A member of the Rebels motorcycle gang is in hospital after being shot multiple times at Upper Coomera. Police have charged several people - including senior Rebels bikie members - after raids across the Perth metropolitan area last week. Methylamphetamine, cocaine, cannabis, firearms and cash was seized in the raids on Thursday, which were carried out in Scarborough, Alkimos, Edgewater, Wangara and Butler. Gang Crime Squad detectives and the Tactical Response Group carried out the raids. A bikie has been sentenced to life in prison for the 'vicious, cruel and unnecessary' murder of a man who tried to intervene during a drug-debt collection. Christmas has passed but the season of giving certainly doesn’t end in December. Khmer Times’ Peter Olszewski writes about Rebels Motorcycle Club’s planned charity, Cambodia Toy Run, in Siem Reap, where underprivileged children on the outskirts of the city will receive gifts from old and new members of the riding club. The Rebels Motorcycle Club will hold its annual Cambodia Toy Run for charity in Siem Reap this year for the first time, after a five-year history of the run in Sihanoukville. Rebels Motorcycle Club spokesman Chris Tallis says holding the run in Siem Reap is a good way of introducing the club to the tourist-favourite town after the Rebel’s breakaway from Sihanoukville. “Some of us went to Kampot and some came here,” he said. “We plan to officially open in Siem Reap in February (and) this is the first run in Siem Reap. (video) --- Collie was inundated with police over the weekend, with approximately 100 officers from Perth making the trip down due to the Rebels’ club run. Collie Police Senior Sergeant Heath Soutar said with 60 Rebels members, nominees and associates staying in the area over the weekend, the contingent of police officers from the Gang Crime Squad had also arrived to ensure the bikies ‘behaved themselves’. “We had no trouble here in Collie over the weekend,” he said. (video) --- A massive police operation has been carried out as more than 500 Rebels bikies descended on Melbourne ahead of a national event celebrating their 20th anniversary in Victoria, as tensions reach a boiling point with a rival gang. Authorities set up an elaborate checkpoint this morning with streets blocked off and hundreds of witches hats lining the road in Sunshine West. Each bikie member was individually screened, with police carrying out license and registration tests. Police sniffer dogs were also on hand to conduct breath and drug tests. (8 pics) --- Taskforce Maxima officers and police from the Mount Isa District have made arrests as part of a major operation targeting criminal activity and habitual consorting under the new serious and organised crime legislation. The Organised Crime Gangs Group established Operation Quebec Schedule with Mount Isa Police District targeting criminal activities of the Rebels Outlaw Motorcycle Gang. On Saturday officers from Taskforce Maxima, State Intelligence, Tactical Crime Squad, general duties, and Criminal Investigation Branch detectives arrested men in Mount Isa, Cloncurry and Rockhampton. Six people were detained including patched members of the Rebels Mount Isa chapter. A 51-year-old man – a member and former president of the Rebels OMCG – was arrested after a search warrant at a West St, home Sunday. (video)---POLICE have used tough new anti-gang powers for the first time against a Rebels Outlaw Motorcycle Gang clubhouse in Brisbane. At around 7.4pm on Friday, officers from Taskforce Maxima raided the property on Gympie Rd, Lawnton, to search for prohibited items that relate to “disorderly activities” as defined in the Peace and Good Behaviour Act. Prohibited items include things such as liquor, drugs, firearms, drinking glasses and entertainment systems. This is the first time these search powers have been used. INVESTIGATORS have charged two men, one in Newcastle, with a conspiracy to murder as part of an ongoing investigation into a chapter of Rebels bikies. Homicide Squad detectives arrested two men, aged 25 and 29, at corrections centres in Newcastle and Goulburn on Tuesday. The pair were both charged with conspire and agree to murder. The charges stem from an investigation by Strike Force Raptor into the Burwood chapter of the Rebels outlaw motorcycle gang and their associates that began in November 2015. A man, now 29, had previously been charged over the alleged conspiracy to murder Ricky Ciano, who died in Oberon in 2017. The latest arrests came following further investigations. The two men charged on Tuesday will remain in custody until they face court in June. Homicide Squad Commander Detective Superintendent Scott Cook said the investigation was ongoing. Four members of the Rebels motorcycle club have admitted being members of an organised criminal group that was dealing methamphetamine and cannabis in Christchurch. Raids on the gang's headquarters in Vagues Rd, Papanui, in 2016, found firearms, 38 grams of methamphetamine, 300g of cannabis, and $35,000, Crown prosecutor Claire Boshier told the Christchurch District Court as the group pleaded guilty on Tuesday. "The Rebels motorcycle gang had as one of their objectives to deal in drugs, notably methamphetamine and cannabis, for profit," she said. 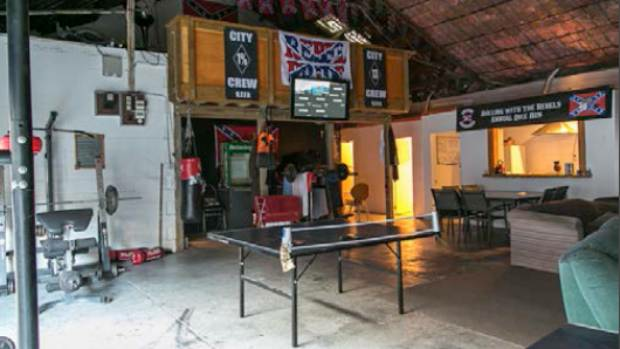 Inside the Rebels' gang pad in Vagues Rd, Christchurch.